UPDATED: Google FAIL. My take on Google + project and other social disasters from Google. I am seriously a skeptic when it comes to Google and social. It's just not in their DNA. Afterall, remember, this is a company that spends countless hours on shaving off milliseconds from server load times. Think about that for a second... that's engineering, NOT social social user interaction or design folks. Don't even get me started on the concept of Google and "community." That just doesn't exist. And therein lies the core of the problem. Google can't engineer its way out of this social conundrum. Disclaimer: I have not yet had the opportunity to evaluate Google + https://plus.google.com. I will try out the Google + tour link. Not sure my opinion would change much, but I could be swayed if I saw something innovative from Google; not getting my hopes up though. Love to know your thoughts, reactions, debates and arguments on this topic. If you were Google, what would you do? Jarvis, anyone? UPDATE: Remarkably, I now have access to the "Keep me posted" form (screenshot below). So, I've now completed that step and am waiting for the official invite to arrive. After completing the form, you'll be presented with the option to learn more and take the tour I referenced above. Around 12 midnight, I downloaded the Android Google+ app to give it a shot. And lucky me, my login worked and I now have access to Google + which is really different. Google + looks terrific on my Dell Streak 5" tablet running Android 2.2. I am still poking around and learning all the features (it's not a simple 1-2 layer deep app). There are numerous features and deep integration with Google products, which is a welcome change. So, now I must confess, I was too hasty with my initial opinion and this blog post. Kudos to Scott Monty who first got me thinking I was being unfair, and he was right. "Just added a Google +1 button to my WordPress blog to show my support! I have to admit, I was too hasty with my initial blog post (apologies for that). I will be sharing my updated views which are very supportive and positive... nice job Google!! So many features, so little time!" 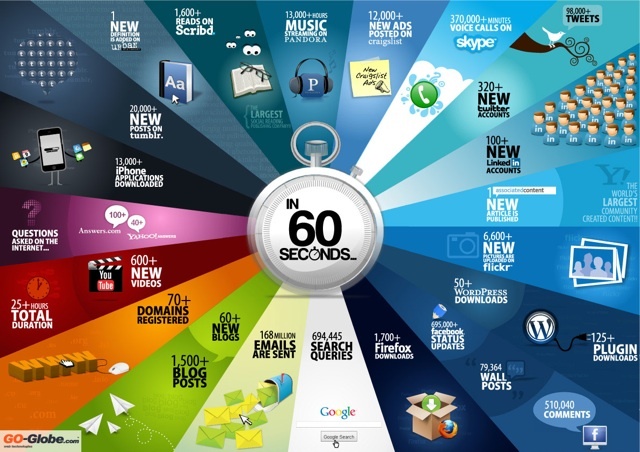 GO-Globe.com created an infographic showing what happens online in 60 seconds. ICANN approved new top level domain (TLD) names today. Does this mean major brands now have a shot at having their name as the TLD name? interesting move! So, will we see Dell.dell or IBM.ibm? The web will sure look different!! Hat tip to CircleID.com for the article. Leafsnap contains beautiful high-resolution images of leaves, flowers, fruit, petiole, seeds, and bark. Leafsnap currently includes the trees of New York City and Washington, D.C., and will soon grow to include the trees of the entire continental United States. This website shows the tree species included in Leafsnap, the collections of its users, and the team of research volunteers working to produce it. Free iPad and Android apps coming soon! Every day, people come to Google Search to ask questions. Through Google, questions become answers, and answers lead to the next set of questions. These people come from around the world and all walks of life, speaking hundreds of different languages, typing in search queries every single day. Today we’re sharing the Search Globe, a new visual display representing one day of Google searches around the world—visualizing the curiosity of people around the globe. 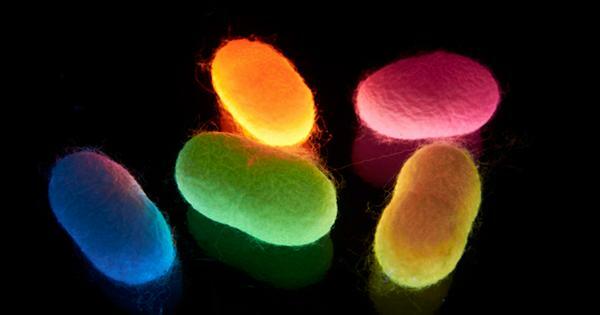 This visualization was developed and designed by the Google Data Arts Team using WebGL, a new technology for modern browsers that uses your computer’s hardware to generate fast, 3D graphics. 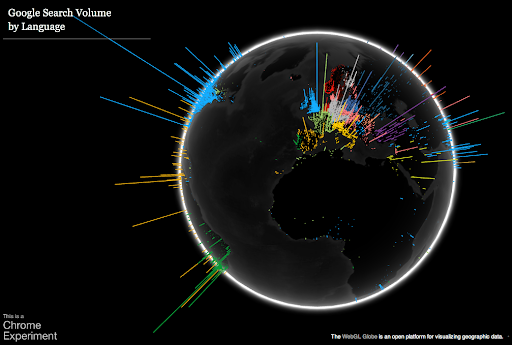 As a result, you need a WebGL-enabled browser, like Google Chrome, to see the Globe. You can learn more about the technology behind the Globe on the Google Code Blog. The Search Globe visualizes searches from one day, and shows the language of the majority of queries in an area in different colors. You’ll see a bright landscape of queries across Europe, and parts of Asia for instance, but unfortunately we see many fewer searches from parts of the world lacking Internet access—and often electricity as well—like Africa. We hope that as the Internet continues to become more accessible over time and people continue to ask questions, we’ll see this globe shine brightly everywhere. We’ve also open sourced this platform so that developers can build their own globes using their own data, and we look forward to seeing other globes orbiting around the web. Today, we’re pleased to announce that Delicious has been acquired by the founders of YouTube, Chad Hurley and Steve Chen. As creators of the largest online video platform, they have firsthand experience enabling millions of users to share their experiences with the world. They are committed to running and improving Delicious going forward. 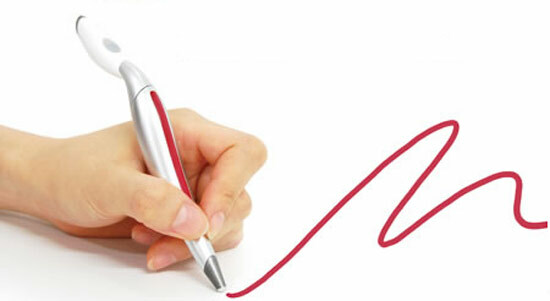 Providing a seamless transition for users is incredibly important for both companies. Yahoo! will continue to operate Delicious until approximately July 2011. When the transition period is complete, your information will be moved over to Delicious’ new owner. Starting today, we will ask you to login to Delicious again and agree to let Yahoo! transfer your bookmarks to the new owner. That way, you’ll enjoy uninterrupted use of the service and will keep your account and all of your bookmarks when we make the transition. For more information on the Delicious transition, please refer to this FAQ. Thank you for your patience in this time of transition and thank you for using Delicious! Sorry if we've caught you by surprise. Delicious has been acquired by the founders of YouTube, Chad Hurley and Steve Chen and will become part of their new Internet company, AVOS. Here are a few links to catch you up to date on the latest news regarding Delicious (blog post, press release). Why has Yahoo! chosen to transition Delicious to AVOS? While we love Delicious (and our users love Delicious), we wanted to find a home for the product where it can receive more love and attention. We think AVOS is that place. When will AVOS officially start running Delicious? We anticipate Delicious in its current form will be available until approximately July 2011. By agreeing to AVOS's terms of service upfront, you will allow us to move your data when the time comes to transfer control to AVOS. What does AVOS plan to do with Delicious? AVOS plans to continue the service that users have come to know and love and by working with the community, make the site even easier and more fun to save, share and discover the web's "tastiest" content. Will AVOS maintain the Delicious service with all of its functionality? Yes, that's the plan. There may be a time of adjustment as AVOS re-launches Delicious, but the company's intention is to add new features and grow the service overall. How do I transfer my bookmarks? To transfer your bookmarks, you need to "opt-in" to allow your account and all associated data to be moved. You can do this from the opt-in page. What will happen to my public and private bookmarks? What if I don't opt-in to migrate my bookmarks to AVOS? You will no longer be able to use Delicious or access your bookmarks after the transition is complete. Is AVOS going to build a Delicious extension that is compatible with Firefox 4.0? Yes. This is a top priority. AVOS plans to release a new extension as soon as possible. For information on workarounds, please see here. 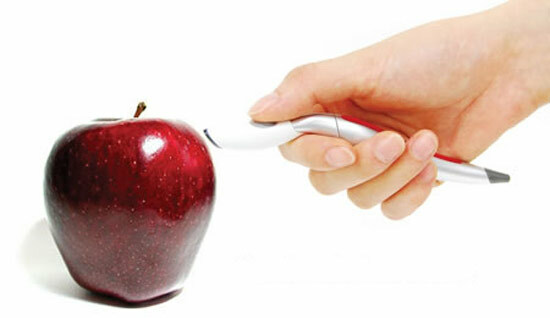 Please visit blog.delicious.com for the latest news on upcoming product releases. Can I export my data from Delicious? Yes. Please use our export tool. If you require assistance, our support team can help you. Enjoying sunny day eating lunch at the Dell RR2 Bistro - love this nice Austin weather! This remarkably beautiful video, uploaded to YouTube one day before the Tōhoku earthquake and tsunami, turns out to be an ad for Sharp’s SH-08C handset. It is, nonetheless, something you shouldn’t miss: in a tranquil forest, a single wooden ball rolls down a stepped wooden ramp, continuously, for two minutes. At each step, it falls and strikes a wooden bar tuned to play a single note of the 10th movement of Bach’s Herz und Mund und Tat und Leben, BWV 147, commonly known by its English title, Jesu, Joy of Man’s Desiring. Wait ’till you see how they handle the sustained notes. A cool infographic design, the Evolution of the Cell Phone by Zitron takes a light-hearted look at the timeline of phone features and the phones that first had each feature. The second part of the infographic, Our Hopes and Dreams, takes a humorous stab at how the reality of our cell phones rarely lives up to our expectations (until the next Buzzword comes along!). Our goal at Google is to get you the most relevant results as quickly as possible. But relevance is about relationships as well as words on webpages. That’s why we recently started to include more information from people you know—stuff they’ve shared on Twitter, Flickr and other sites—in Google search results. Today we’re taking that a step further, enabling you to share recommendations with the world right in Google’s search results. It’s called +1—the digital shorthand for “this is pretty cool.” To recommend something, all you have to do is click +1 on a webpage or ad you find useful. These +1’s will then start appearing in Google’s search results. Say, for example, you’re planning a winter trip to Tahoe, Calif. When you do a search, you may now see a +1 from your slalom-skiing aunt next to the result for a lodge in the area. Or if you’re looking for a new pasta recipe, we’ll show you +1’s from your culinary genius college roommate. And even if none of your friends are baristas or caffeine addicts, we may still show you how many people across the web have +1’d your local coffee shop. So how do we know which +1’s to show you? Like social search, we use many signals to identify the most useful recommendations, including things like the people you are already connected to through Google (your chat buddies and contacts, for example). Soon we may also incorporate other signals, such as your connections on sites like Twitter, to ensure your recommendations are as relevant as possible. If you want to know who you're connected to, and how, visit the “Social Circle and Content” section of the Google Dashboard. We’ll be slowly rolling out +1’s, starting in English on Google.com. If you can’t wait to start seeing +1’s, we’ll soon let you opt-in to the launch by visiting our experimental search site. Initially, +1’s will appear alongside search results and ads, but in the weeks ahead they’ll appear in many more places (including other Google products and sites across the web). If you’re an advertiser and want to learn more about how the +1 button works on search ads and websites, visit our AdWords blog. We’re confident that +1, combined with all of the social content we’re now including in search, will mean even better, more relevant results than you get today. 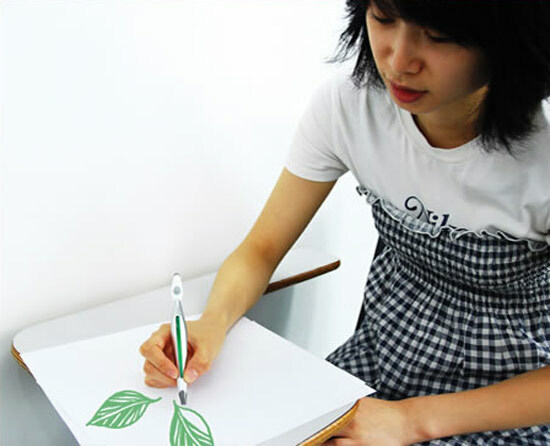 Korean designer jinsu park designed a con­cept pen that adopts the eye­drop­per tool of pho­to­shop for real life. 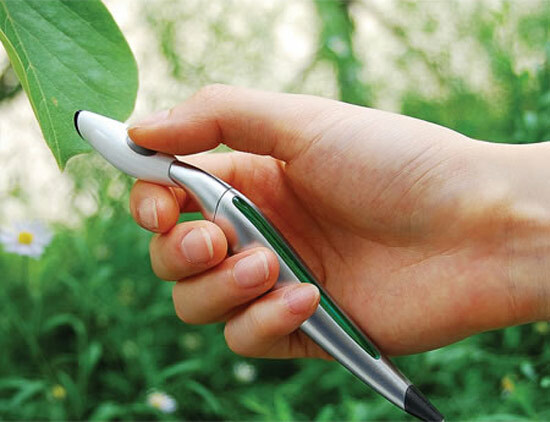 The color picker pen enables col­ors in the envi­ron­ment to be scanned and instantly used for draw­ing. 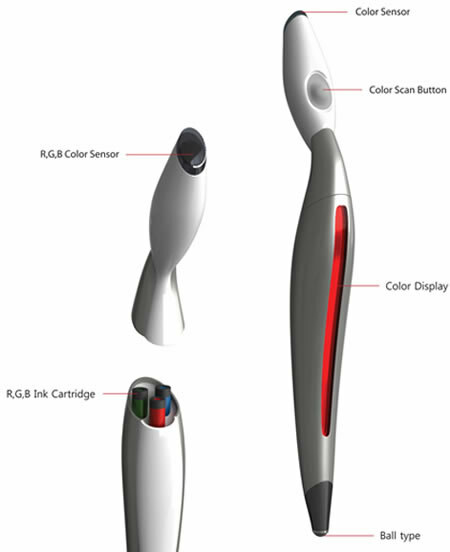 The sen­sor detects the color and matches it to the color dis­play, then the RGB car­tridge located within the pen mixes the inks together to cre­ate the color that has been scanned. As promised, we’re starting to take a closer look at LinkedIn. Its power and influence are growing and it’s quickly becoming one of the “must have” profiles for businesses and professionals alike. This graphic by our friends at Online MBA puts it all into perspective. LinkedIn is one of the fastest growing social networking sites in the world. While its numbers pale in comparison to competitors such as Facebook and Twitter, catering to business professionals gives the site a unique advantage. Seeking to capitalize on its growing notoriety, owners recently decided to take the company, filing for an initial public offering last month. But how do you put a price on being Linkedin? 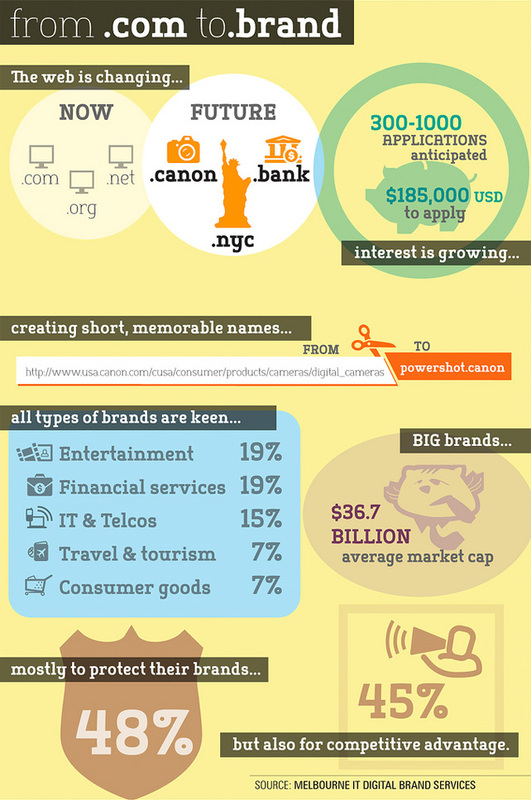 Before you run out to buy yourself a thousand shares, take a look at our breakdown of the social networking powerhouse.